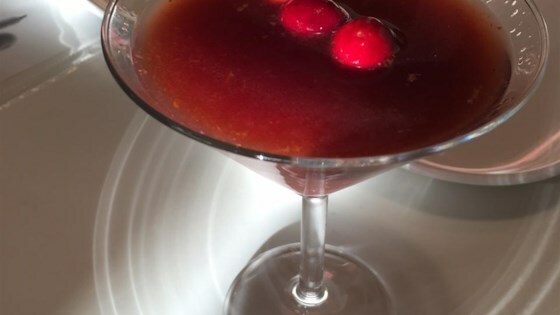 "This cocktail is crisp and elegant, with deep, earthy notes and a ruby color." Place vodka, grapefruit juice, pomegranate juice, vermouth, cream of balsamic, cranberry juice, and peppercorns in a cocktail shaker. Fill shaker with ice and shake well; strain into a martini glass. Sprinkle with orange zest. Substitute aged balsamic vinegar for the cream of balsamic if preferred. Great cocktail! I tried it over the holidays and it was a great hit. You definitely want to use fresh squeezed juices and a good quality balsamic vinegar. I didn't use cranberry juice. This was a really lovely cocktail. Well balanced and not too sweet. It also looked beautiful in the glass.